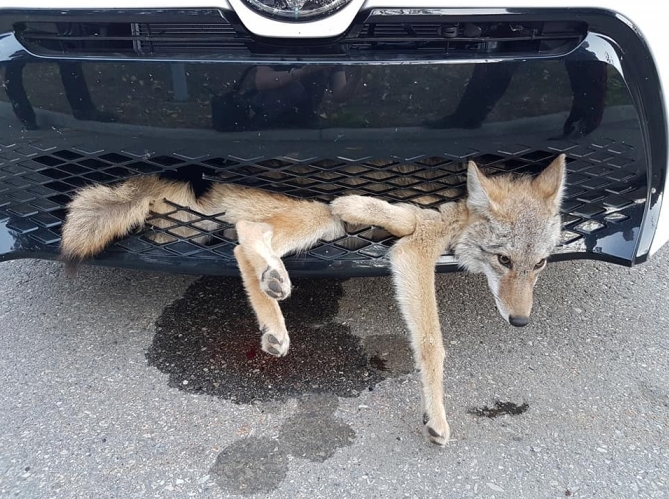 A coyote in Canada went for a wild ride last week after being hit by a woman’s car and being “embedded” in the car’s grille. Georgie Knox said she was driving to work early one morning when the coyote darted out in front of her car. “I heard a crunch and believed I ran over and killed it,” Knox wrote in a Facebook post. Thinking the poor wild animal had died, Knox continued on her 20-mile trip to work. 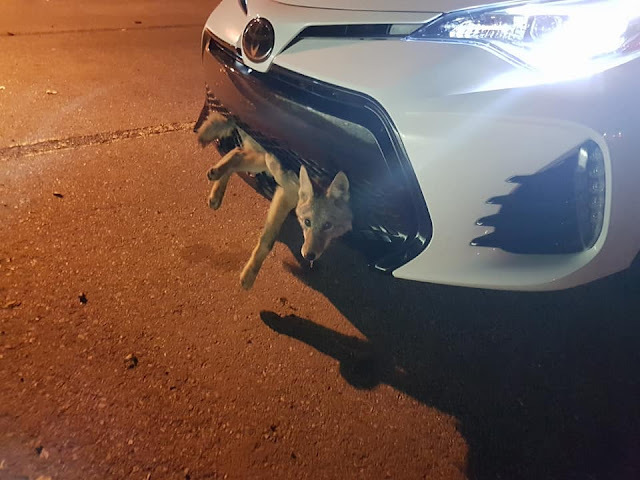 It wasn’t until Knox reached Calgary, Alberta, that a construction worker told her the coyote was in fact stuck in her car’s grille. “When I got out to look, this poor little guy was looking up and blinking at me,” Knox wrote. Knox alerted Alberta Fish & Wildlife and asked to have the coyote freed. Miraculously, the animal suffered only minimal injuries, she said. Biologists gave the coyote a clean bill of health and returned it to the wild. “Clearly mother nature has other plans for this special little guy,” Knox said. Responses to "Woman drives 20 miles with coyote 'embedded' in car's grille"
Vile woman, hits something, has no idea what it was or if it was still alive, but doesnt stop to check? Disgusting behaviour!